We love the concept of a precise and decentralized GPS system which can be used for consumer purposes, however there are a lot of uncertainties concerning the implementation of their blockchain and the launch of their LEO satellites. It will take tremendous efforts and money to realize a project as big as this one. Location data is used by individuals, companies, industries and governments across the globe on a daily basis. From mapping, self-driving vehicles, trade and parcel delivery services, location data has many use cases in today’s world. However, traditional GPS location data service providers do not always prove to be reliable and often do not offer precise location data. The European Union is building the Galileo GPS satellite system just because of this inaccuracy. This inaccuracy is not a design flaw or a misalignment between satellites, it is due to design. The US military uses GPS for their GPS guided missiles and they do not want other nations to be able to use their technology for the same reasons. This makes GPS not really suitable for delivery systems that need to be reliable and accurate. This is where XY excels at, they are developing a reliable, verifiable and efficient data location system based on blockchain technology. You can think of it like a crypto-location ecosystem which utilizes the decentralized features of blockchain technology to deliver unrivalled location data services. This ecosystem is trustless and runs on distributed ledgers. Created in 2012, XYO is an IoT hardware manufacturer and location data service provider which boasts of one of the largest networks of GPS and Bluetooth beacons in the world. As of writing, XYO has over a million beacons spread across the world. The XYO Oracle Network (XYO) is a decentralized blockchain platform that enables trustless interaction among crypto -location components. The XYO blockchain network comprises four components: Sentinels, Bridges, Archivists and Diviners. All these components work in concert to verify location data. It allows developers to build decentralized apps on top of the network to interact with the real world. Like most cryptocurrency projects, XYO has a cryptocurrency token named “XYO” which is the fuel for the network. Crypto- location miners, in this case, verifiers are paid using the XYO tokens. What problems does XYO aim to solve? Traditional GPS technology has not been reliable and precise. XYO seeks to revolutionize the location-data industry by bringing decentralized components that verify data to ensure certainty. How does XYO aim to tackle these issues? The XYO network itself utilizes the Proof of Origin algorithm which basically means that thousands of Sentinels in the network can verify location data while still maintaining high levels of confidence in the heuristics. How does the XYO blockchain work? Sentinels are heuristic witnesses. They observe and vouch for accuracy of heuristics. Sentinels produce ledgers through the Proof of Origin protocol. Bridges are transcribers. Their work is to relay heuristic ledgers that are generated by sentinels, to the diviners. Archivists are storage mechanisms for heuristics. They store location data in a decentralized method. They earn rewards for retrieving raw data rather than for storing it. Diviners are incentivized to generate an honest analysis of the heuristics they receive. Unlike sentinels and Bridges, Diviners use Proof of Work protocol to create answers to queries raised on the blockchain. The beauty of the XYO network is how it’s designed to integrate easily with leading blockchain platforms. Ecommerce: The e-commerce industry is an active consumer of location data. E-commerce giants have to rely of location data to make deliveries to consumers. Despite the continued growth of the e-commerce industry, the problem of poor quality location data continues to bog down the lucrative industry. In the U.S alone, theft of packages has been a common problem. With XYO, e-commerce firms can now track the progress of packages from the warehouse to the customer’s door. Medical Care: Did you know that millions of people in the U.S die every year because of medical errors? According to a recent study by Johns Hopkins School of Medicine, medical errors are responsible for millions of avoidable deaths. XYO’s decentralized platform can solve the problem of poor record keeping and communication in hospitals. The rental Cars Industry: Car rental firms face logistic challenges. Most of these firms lose millions of dollars every year simply because a customer misplaces car keys. To this end, XYO is already piloting a service with one of the largest car rental agencies in the U.S to help them with locating lost car keys. Commercial Airline Cargo and logistics: According to a recent study by SITA, airlines cumulatively lost $2.1 B in the form of lost luggage. With XYO, airlines can utilize their networks fully, as well as utilizing each other’s cargo networks without hitches. Insurance agencies Insurance firms face the recurring challenge of lost insured goods and fraud. The XYO network is best suited to track vehicles for insurance companies as well as helping then access a verifiable location history to rein in fraud. Security agencies: XYO creates a secure system for high security areas like armories. As of writing, XYO is working with a government agency to secure its firearms. Drone package deliveries: Drones look likely to become the future of package delivery. As more and more ecommerce e4giants implement automated drone deliveries. The XYO network helps such companies to map drones and deliver a verifiable way of tracking them wherever they are. The XYO project is headed by a diverse mix of experts with backgrounds in software development, entrepreneurship, and marketing. We will just look at a cross section of the core team. Markus has over 15 years of experience in managing and growing companies. Besides being a blockchain enthusiast he makes sure to utilize the best qualities out of his team. XY advisors include Tom Kysar, the operations head at Augur, Raul Jordan, an Ethereum Geth developer and Ismail Malik, CEO of Blockchain Labs. One of the biggest promises of blockchain is that it is trustless, and this works fine in a digital environment but it can cause problems when dealing with physical services. The XYO project tackles at least one of the problems that arises in the physical world, namely the precise time and location of an object. This is a huge advantage for delivery systems, companies can not only track packages but can also enjoy automatic payments when packages are delivered. 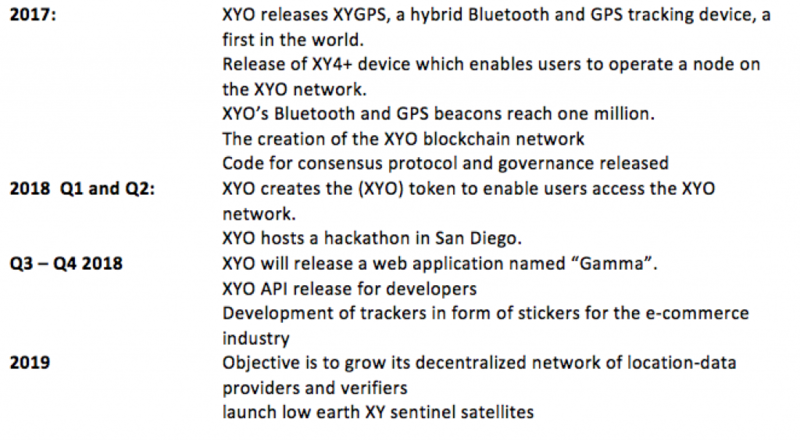 XYO has the advantage of having a working product with thousands of beacons already deployed in the market. They have a wealth of experience in the industry, the company has been around since 2012. XYO aims to natively integrate with today’s biggest public blockchains like Ethereum, EOS, IOTA, NEO, Stellar etc. This functionality greatly enhances their reach and possible route to mass adoption. Whilst XY is an established company, there seems to be no prototype of their blockchain yet. They want to launch low orbit (LEO) satellites in 2019 which seems a bit optimistic to me. The LEO satellite technology looks promising but still faces a lot of technical hurdles. Smart Contract risks, Key features will be implemented in smart contracts, the nature of smart contracts makes them difficult to change and to fix bugs, improve performance, or add features and functions.